Those of you who've managed to wade through the latest episode of The Nichiest Podcast Ever already know this (well, if you paid attention from beginning to end), but for those of you who haven't: since the holidays, I've gone on a bit of a gaming shopping spree. Although the bulk of my Christmas cash was spent on a stack of Japanese DS games (I'll publish a post on them as soon as all of the have been delivered), I also bought a couple of GameBoy Advance, Game Gear and PC Engine titles. One of the three PC Engine games I picked up is the one seen in the photos below: Atlus' wackadoodle Mesopotamia (aka Somer Assault). Anyway, you control an armed Slinky while playing this 1991 release. Oh, and you guide him through 12 maze-like stages in an attempt to track down the Zodiac-themed bosses that reside within. Wackadoodle, no? I've got to be frank: although I've always respected and even appreciated Mesopotamia's off-the-wall protagonist and premise, I've never been much of a fan of its tough-to-come-to-grips-with gameplay. Until recently, I mean. I'm still not very good at it, but I enjoy it a lot more than I did in the past. That said, the main reason I picked up the copy showcased above now rather than later is its cover art. Sure, it's about as wackadoodle as the rest of the game, but that's part of its charm, don't you think? I especially like those googly-eyed illustrations of its protagonist. In fact, without them, this import probably would've lingered on my lengthy "to buy" list for a few more months (if not years). Attention "Manual Stimulation" fans: I'll be publishing another installment of that vaunted column next week and it will focus on Mesopotamia's black-and-white-but-still-fabulous instruction manual. 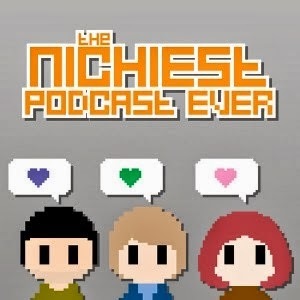 OK, so this episode of The Nichest Podcast Ever, our eighth, actually was pulled from the oven yesterday, it's still pretty fresh. Anyway, a new episode. Yay! Assuming you like podcasts, I mean--and this one in particular. What kind of ground do Anne, shidoshi and I cover this time around? Well, we begin by chatting about our "holiday halls" before moving onto the return of Wonder Momo (don't feel bad if that means nothing to you), the newly announced Senran Kagura and Persona 3DS and Vita sequels and spin-offs, the censorship (or not) of Bravely Default and Chibi-Robo! Photo Finder as well as Anne's Twitter-based #Falcomonth. Anyway, if you'd like to give it a listen, direct your favorite Internet browser to radio.morningproject.com as soon as time permits. 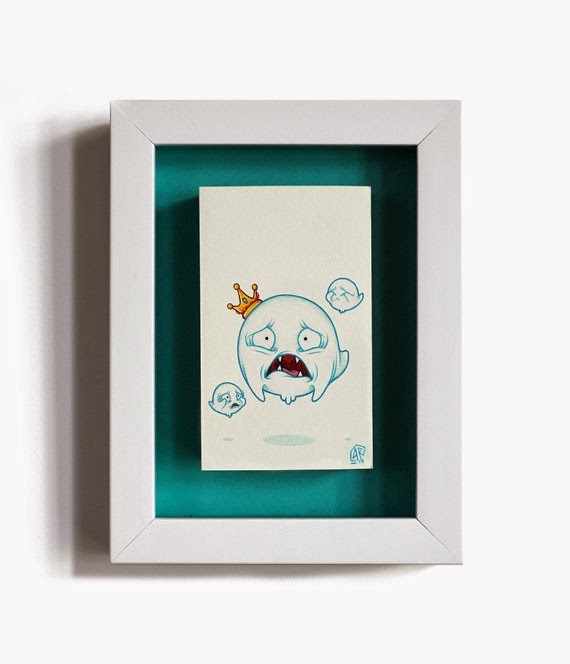 Although scores of people have produced illustrations, paintings and other pieces of art that depict Nintendo's characters in various states of undress, few have done so with the kind of whimsical verve that's on display in each and every one of Aedan Roberts' "Nüdtendo" portraits. You see, all 18 of the portraits Roberts has completed so far render the Japanese giant's extensive stable of colorful protagonists and cohorts as both naked and, to varying degrees, surprised and embarrassed. Roberts recently agreed to answer a handful questions about what prompted him to start the series, why he decided to focus on Nintendo characters, how many more he plans to produce and much more. The Gay Gamer: When did you start creating these "Nüdtendo" portraits, and what prompted you to do so? Aedan Roberts: I began creating this series back in the summer of 2012. Up until that point, all my gallery work was intentionally devoid of work that contained other people's intellectual property. I was still trying to figure out a way to do it without falling directly into the "fan art" category while also doing something fun and original. At the time, I was doodling some of my favorite characters and was up to Mario. I tend to draw my characters naked when I'm working out their proportions and then add the clothes in a later version. But before I could progress, my boyfriend stopped me and told me I had something with this stout, squat, embarrassed creature I had just doodled. So I finished him up, painted him, and then did another two vignettes (Link and Samus). The results were so popular that I decided to go whole hog and make it into a series. The Gay Gamer: Why did you decide to focus on Nintendo characters? Aedan Roberts: The decision to concentrate on Nintendo characters was both because I love the long, storied history of Nintendo intellectual property and because it gave unity to the project. I grew up as a fan of Nintendo. Our very first console was an SNES and from there I have owned every single generation (barring the Wii U at the moment). I have such an emotional attachment to these characters, and if I was going to create a satire where I reproduce a famous series of characters, I wanted it to be these. The Gay Gamer: Was your plan all along to create a series, by the way, or did that just come to you after you'd made a few? Aedan Roberts: I decided to turn it into a full-on series after the original three proved to be so popular. I then gave myself a goal--52--that I don't know if I'll reach, but I'll definitely try. The Gay Gamer: Can you tell me a bit about how they're created? Based on the descriptions you've included on your etsy shop, I'm guessing they're paintings? Regardless, what kind of process do you go through to produce them? Aedan Roberts: Each character is drawn out so I can translate it into my style. After that, I try to make sure the proportions are in line with the previous characters and then I re-draw the sketch onto hot press watercolor paper. I then glue the paper to a small wooden board, paint the character and then place the board into a custom-painted shadowbox. The color of each shadowbox is made to coincide with the character within. That way, when the shadowboxes are placed together, it forms a pixel-like color grid. Full disclosure: I've sadly never experienced any of Tecmo's trap-setting Deception (Kagero in Japan, for most part) titles. I may have to rectify that once I finally get a Vita (in 2015? 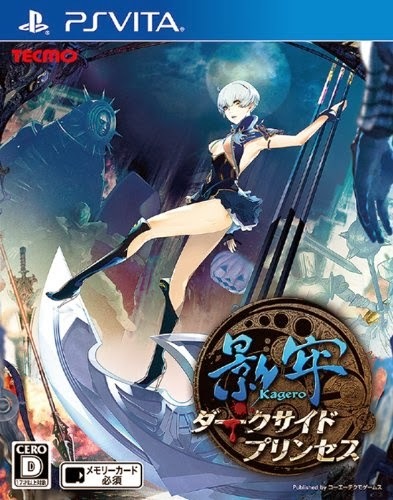 or maybe I'll break down later this year and buy one...) given the beauty of the following piece of box art, which was produced for the Japanese version of seres' fourth game (called Kagero: Darkside Princess in its home region and Deception IV: Blood Ties elsewhere). Granted, there's no guarantee the North American release's packaging will feature the same radiant--and more than a bit fanservice-y, I have to admit--illustration that'll grace the cover of its Japanese counterpart, but I'm hopeful the folks at Tecmo will do the right thing and leave well enough alone when they bring the game to western shores in a few months. Are any of you Deception/Kagero fans? Even if you aren't, are any of you planning to pick up this entry in the series--either because of the box art above or despite it?